This thread is way overdue, but I had a little time over the holidays to get some pictures together for it so here goes. This guide is by no way for proffessional sailors or to be used as a guide for the more veteran sailors amongst us. This guide is to be the first step of many for the VSK ACC Sailor, a learners guide for those guys that may be struggling to keep up with the fleets during online games. So having said that I would appreciate it if the veteran guys would keep to what they know best which is explaining the more advanced techniques and practices. This guide is "just" for the basics, so that beginers may have a better understanding of what is required to enhance your performance and give you that first crucial step in (what is) a cognitive process in eventually developing from a novice into a champion racer. The first step you have probably already done, which is just to have a sail and gaining an understanding of the boat and how it moves in the water. So I will take it that anyone reading this has at least knows this much. The concepts of capturing the wind and tacking etc. I am by no means a proffessional sailor and have never stepped onto a real yacht, my perspective on this is purely from a gamers point of view, I'll leave the finer points of sailing to some of my more veteran coleagues. The very first thing that I learned playing VSK was the few things that I am now going to share with you and hopefully it will help you to perform a little better. So lets get started with TWA or True Wind Angle. You will find your TWA on your instrument panel, this is the most important guage in your early days of sailing. The TWA is the angle to which the wind is captured by your sails obviously the correct angle is vital to gaining the most speed out of your yacht during a race. When sailing windward or sailing into the wind, there are a few important things to remember and players should stay disciplined about this when they play. 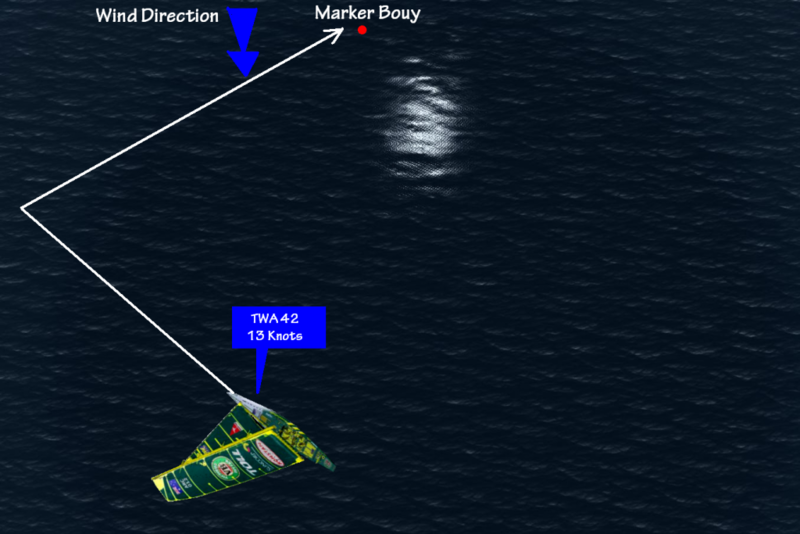 It is usually the windward sectors where most beginers start to struggle and get left behind by the fleet, and the more windward sections there are, the further behind they usually get. 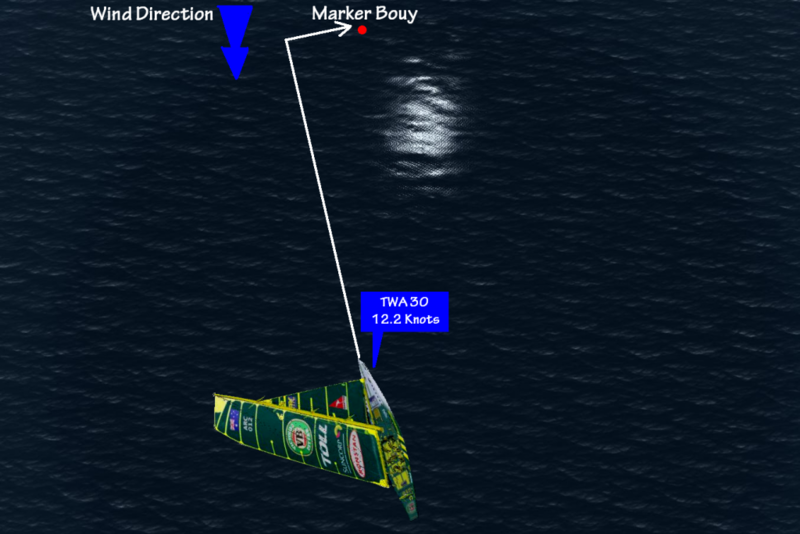 So here is the first few things the beginers should know about sailing into the wind. Keep your TWA between 29 and 32 never any less and never any more when sailing into the wind, dont be compelled to tack out harder just because it gains you more speed, this is the big one for beginers to learn. Remember that the closest didtance between two points is a straight line. But we cannot do this when sailing into the wind, so we have to sail at an angle to keep propelling the boat forward. When tacking or rounding a marker, we want to get the boat moving again quickly so after a tack I will generally bring my TWA to between 32 & 34 to get up to speed again quickly, then I will gently bring her back to 30 to 31 TWA. I know when I first started playing I would tack simply because I was getting bored, but players should understand that everytime you tack it slows the boat down. I kind of learned this myself and started doing a little better once I started tacking less often. Wait for the shifts and watch your angle to the mark. "Least amount of tacks wins the race", of course this is not always the case but if you use this as a guide you will find you get better results. On the least tacks wins the race, that quote is from yours truly, also like I said alot of things I write will not be agreed with. Thats fine. I guess what Im trying to say by the "Least Tacks Wins" is just a principle that should be used by beginers so that they do not tack too often - I was going to get to that. I think alot of beginer players do this alot because they get board or try to out-fox the fleet. But really all they are doing is slowing themselves down, "least tacks" just simply means be aware that you dont tack to often and wait for the shifts. Obviously I have not covered everything just yet but Im getting there. Dan you are on to something there. you dont want to tack all over the place but we need to try to tie it in with mid and what the right heading is to the mark is.